For this project, we were hired to design a kitchen renovation for a previous client. The kitchen was located at the back of their mid-block rowhouse and had an atypical layout which made the room seem small and constrained. Initially, we were asked to help with the selection of new cabinets and appliances to replace the existing ones, as our clients believed that there was no other way to configure the layout. 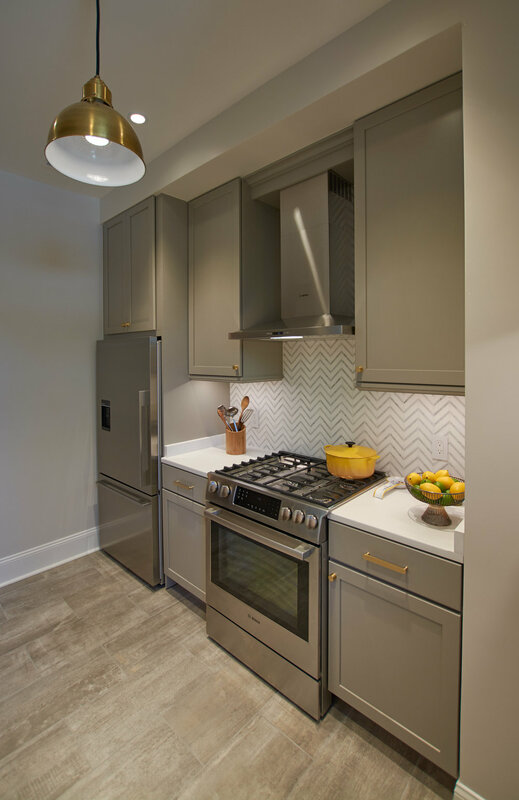 However, we provided a few options for redesign, and our client settled on one which opened up the center of the room to provide ample clearances between appliances and work surfaces, and which gave the window more prominence in the space. The long side wall with no door or window openings was the obvious location for the range, range hood and the refrigerator, since these kitchen appliances are tall. 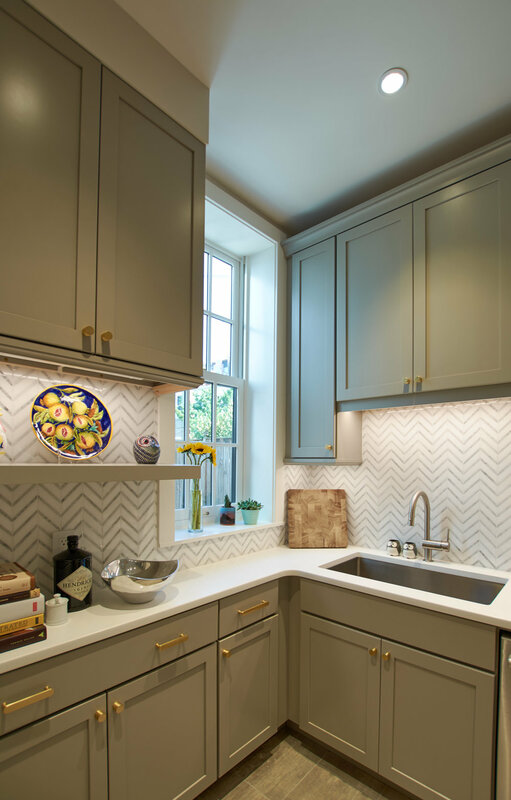 The use of open shelving on the window wall allows the shelves to appear less bulky than a cabinet, thus blocking less light and and allowing the tile pattern to continue behind. The lower cabinets along the window wall are 12” deep instead of a more standard 24” depth, which gives more length for the cabinets at the sink wall. Investigation during the demolition phase led us to find that the lowered ceiling area above the refrigerator and range could be raised up to allow for taller upper cabinets. The kitchen walls and floor were insulated and sealed to provide greater comfort.